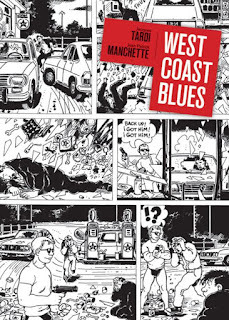 West Coast Blues (Fantagraphics) is a comic that I should have loved. 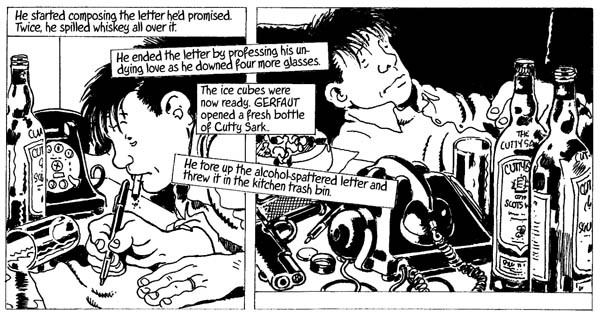 Artist Jacques Tardi’s adaption of Jean-Patrick Manchette’s novel Le petit bleu de la côte ouest has the right elements: it’s black and white, it’s noir, it’s French. Nevertheless, I did not like West Coast Blues. Actually, I simply didn't like it very much. I read it, and I didn't suffer because of it. But I was never too interested in the plot or drawn into the characters' struggles. And I never really wanted anyone to get shot – though I didn't mind seeing it happen. George Gerfaut is pursued by two hit men after he plays Good Samaritan to one of their victims. He goes on the lamb, abandoning his career and his family for refuge in the French Alps. As things tend to happen in crime fiction, his past catches up with him. So he has to shoot people.West Coast Blues is true to this basic film noir premise of man-pursued-by-unknown-forces. But the story does not develop much beyond this setup. There’s too much fleeing, too much hiding, punctuated by instances of violence. Jacques Tardi’s artwork stands up better than does the book's plot. 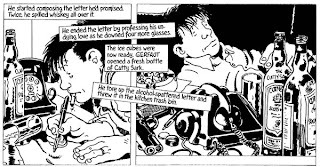 Tardi’s black-and-white cartooning – evocative of both Hergé and Robert Crumb – never goes too noir, relying instead on a more subdued and clear treatment of light and dark. But there’s just not a lot here for Tardi to work with. The story may have simply become lost in translation, though editor Kim Thompson in fact does a wonderful job translating West Coast Blues with a very American voice. The problem may lie with Jean-Patrick Manchette’s original work – which I have not read. Or the problem may be that Jacques Tardi’s adaption itself failed. We may never know. Nerd Coefficient: 5/10 – "Problematic, but has redeeming qualities"